I recently finished building a Chesapeke 17 from plans and am proud of the boat but I have just been totalling up the cost and find that it has cost me £87 more to make the boat than the kit cost! I am afraid that this is not an unusual situation. There is no magic to it: it is simply that we order a lot more of the materials than a single build customer and thus get the materials at a lower cost. Since all of the items are sent from the same place it is also true there is a saving on courier charges. Fellow builders, an alternative view here! Do not abandon hope if you're considering a plans-only build. Plan building can be cheaper and substantially so. Whilst I agree that the materials for sale are carefully chosen and of high quality, Fyne Boats is a 'boutique' with prices to match. This will suit some builders for whom convenience is more important than price, but very good materials prices are widely available to single builders for most of the common and important major components. For example, in September I took delivery of 5 full sheets of 6mm Okoume BS1088 'Lloyds Register' marine plywood + 2 sheets of 9mm ply to the same spec for my NE Dory from plans build. This was delivered to my door for £335 by my MGM wood merchant (part of the Timbmet group). Fyne couldn't get anywhere near this (£464 at the time of writing, not including delivery). Actually, delivery costs can price Fyne Boats out of the market - at least that was the case for me at my Scottish Highlands home address. Fyne Boats delivery for the same order would have been circa £200 to my postcode. Fyne Boats offer an important service (and is a good business model) but there are more economical choices for the impecunious prepared to do a bit of legwork chasing down prices. Thank you for your comments about being a boutique business and also your feedback. Feedback is always important to us and you are right to highlight the cost of sending kits to the Highlands. It is expensive and if you know of other carriers who can reliably move kits for a better price we would love to hear from them. Incidentally, it would have been £64 to send your delivery to Aberdeen. We price our wood as keenly as possible ensuring that we use ‘A’ quality veneers as well as a Lloyds Approved mill supplying sheets which exceed the BS 1088 standard. Naturally, we require it to be from a managed source where a reforestation plan is in operation. Boats can be made from lower quality wood but, when considering the time spent and other consumables used building a boat, the cost of the wood is relatively low and we believe in making a boat only once. A couple of weeks ago someone brought us the rudder stock pictured below which they claimed was made from BS1088 marine ply. I can't afford to get a kit sent out to me here in Turkey so it'll only ever be plans. It seems that just about everything is increased when building boats here - I either pick up bits when I'm in the UK (cheers you guys at FB for providing the service and being close enough to my son's house) or incur costs for shipping. I can't get decent plywood here - I've been making a sole plate for my friend over the last few days from some 10mm ply I had sitting around and couldn't believe the number of voids in it despite being stamped up as marine ply - so every inch gets fibreglassed making the boats heavier as well as more expensive. I usually use heavier f'glass than the plans call for (especially on the bottom) as there are few sandy beaches around here but lots of stones and rocks. The plywood doesn't come in 8 x 4 sheets either but in 2.2 x 1.7 metre sheets so extra time is taken to try and minimise wastage. So more cost, more weight, more time building, more mistakes . . . But you know what? Whilst I have no issues about building from a kit - why not, I sometimes wish I could - it's building the whole thing that does it for me and I'd feel as if I was cheating a bit if someone else cut all the bits out! The kits are great for those who feel they don't have all the necessary skills and abilities and they can be great for first timers wanting to give boat building a go. Long may they be available. I'll probably see you guys in Kendal in January - I'm making a list, just have to watch the weight allowance and the budget. I had no problems carting the spoon blade oars back here last January by the way and they're absolutely great, really set the Skerry off and being in SW Turkey they are I think, unique around here. Oh, I nearly forgot marlinspike, I usually end up buying more tools too! Obviously cost is important in this market - if we were rich we would be talking to Sunseeker!! My main reason for buying in kit form (7 boats/canoes to date) is to avoid wrestling with 8 x 4 sheets and the importance of accurate cutting if you are to achieve the smooth shapes which make these boats a delight to see. I can appreciate the pride you take in doing everything yourself but its not for everyone and I certainly would recommend kits for first time builders unless the boat is very basic. However thank God we are not all the same and the best of luck wsith your projects. Phil, that is a shocking picture in your posting above. 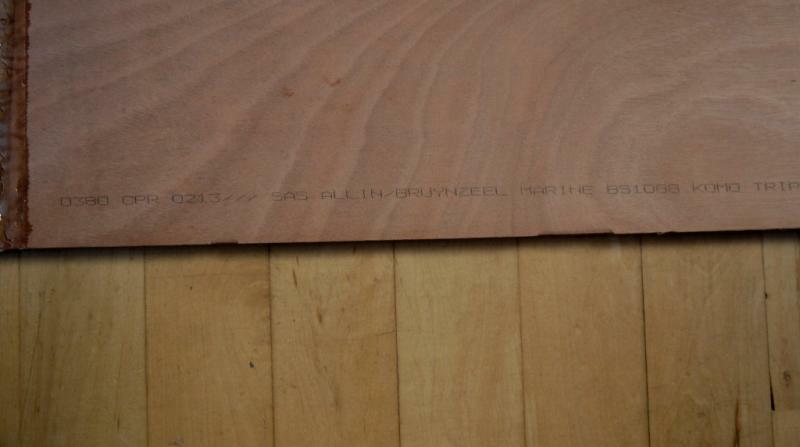 Really alarming that Far Eastern ply of unknown provenance has been passed off as Marine plywood. 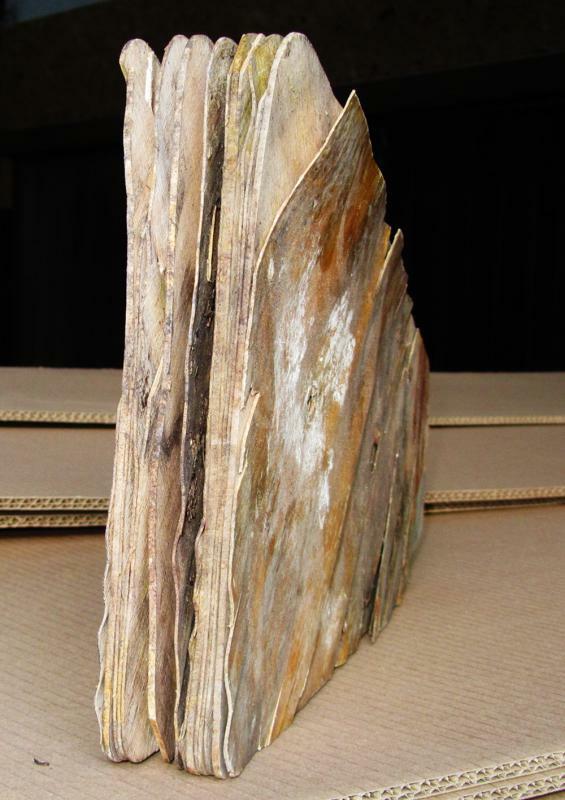 Interestingly, the Timber Trades Federation has taken action within the past year to proscribe the mis-labelling of run of the mill FE ply as far superior Marine plywood. The new TTF code of practice came into effect in June this year (2016). With this in mind I had a long conversation with my supplier about the plywood specs and associated markings that appear on each sheet. The sales guy I spoke to admitted that plywood specs and markings had been "a dog's breakfast" in the past and a nightmare for the timber merchant and end user alike. The new regs (only applicable to TTF members - most larger timber merchants are members) should instil more confidence and certainty for everyone selling and using marine ply. (Recently glued and cured scarf joint just visible on the left of shot!) 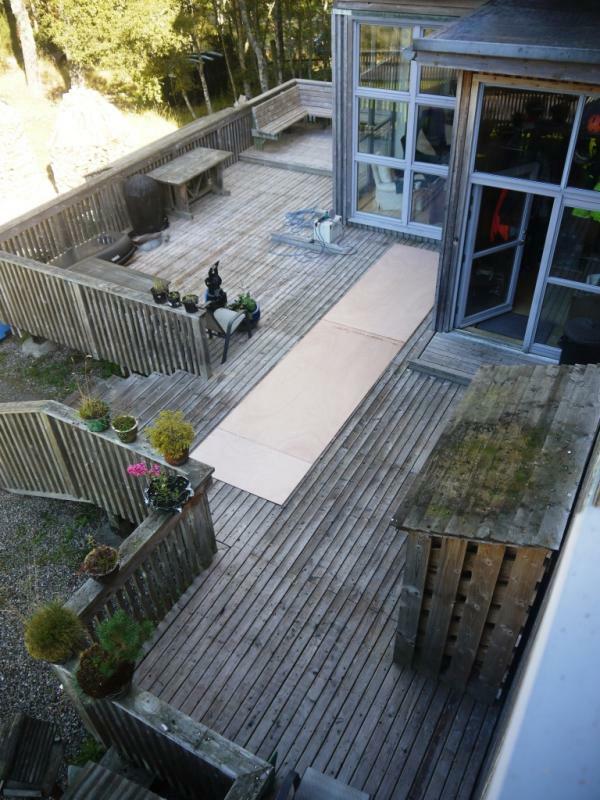 The plywood came in 1.220 x 2.5m sheets; was expecting 1.220 by 2.440m. Derek Blay - Re. wrangling full sheets of plywood. Individual sheets are no problem. Handling two and an quarter scarf jointed sheets end on end for my NE Dory was a nightmare! (Glued up and ready for the transfer of shapes from the supplied full size plans). Building from plans is definitely not for the faint-hearted....or the weak-of-back! Yambo - I'm with you on the satisfaction of building a boat from a pile of plywood sheets and timber....despite the complaints from my back!